This is a very simple question. 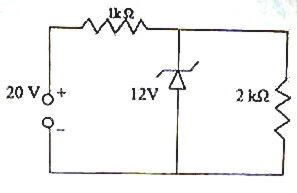 The voltage across the reverse biased Zener diode is its breakdown voltage, which is indicated in the figure as 12 V. The load resistor 2 kΩ is connected across the Zener diode and hence the current through it is 12 V/2 kΩ = 6 mA. In the simple shunt voltage regulator circuit shown in the adjoining figure, the unregulated supply voltage varies between 8 V and 10 V. If the maximum reverse current that the Zener diode can safely handle is 100 mA and the Zener diode should draw a minimum current of 5mA (for reliable operation of the voltage regulator), what is the expected maximum current drawn by the load resistor RL? Since the maximum current allowed through the Zener diode is 100 mA, the maximum current drawn by the Zener diode and the load resistor together is 100 mA itself. 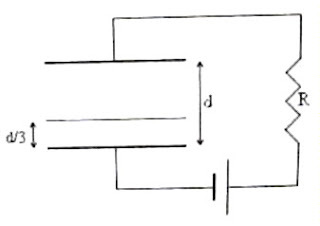 If the load is disconnected, the entire current will flow through the Zener diode and this is to be limited to 100 mA. As the Zener diode is expected to draw at least 5 mA (which happens when the load draws the maximum current), the maximum expected load current is (100 mA – 5 mA) = 95 mA. [Note that in the shunt voltage regulator, the Zener diode and the load together draws the same current irrespective of the input voltage variation and the load current variation (within the design limits)]. In the above question, what is the value of the series resistance R? You have to consider the maximum unregulated input voltage to determine the value of R. Here it is 10 V. Since the regulated voltage (break down voltage of the Zener diode) is 6 V, the voltage drop across R must be 10 V– 6 V = 4 V.
R = 4 V/ 100 mA = 4 V/ 0.1 A = 40 Ω. The electric field at O is due to the negative charge at C only since the equal positive charges situated at A and B will produce equal and opposite fields at O (and they will mutually cancel). The field at O is therefore negative and the option (a) is obviously wrong. Option (b) also is obviously wrong. Thus F = q2/54πε0R2 as given in option (c). 1/C = 1/(K1ε0A/t1) + 1/(K2ε0A/t2) + 1/(K3ε0A/t3) + etc. In the present problem, the thickness of the layer of liquid (which serves as the dielectric slab) at the instant t is (d/3) – V t and the thickness of the air space is (2d/3) + V t.
Substituting for A = 1 and K = 2, we obtain C = 6ε0/(5d + 3Vt). 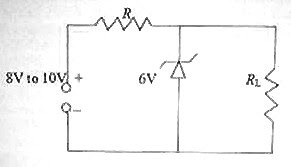 The time constant of the circuit = RC = 6ε0R/(5d + 3Vt). You should note that moment of inertia is a scalar quantity so that the total moment of inertia of the bent rod is the sum of the moments of inertia of the two halves about the common axis. [The axis must be the same when you add the moments of inertia, for obvious reasons]. 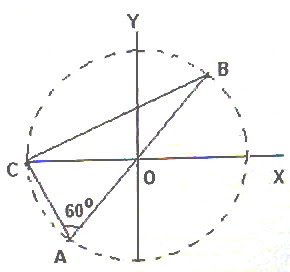 Since the moments of inertia of circular disc and circular ring about their axes are respectively MR2/2 and MR2, their radii of gyration about their axes are R/√2 and R respectively. [Remember that I = Mk2 where I is the moment of inertia and k is the radius of gyration]. Therefore, the ratio of the radii of gyration = (R/√2)/ R = 1/√2. When the rider feels weightless, the weight of the rider is equal in magnitude to the centrifugal force. 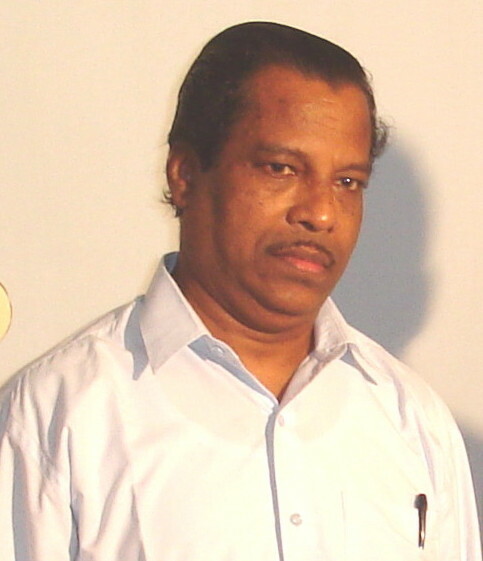 v = √(rg) = √(20×10) = √200 = 14.14 m/s. The correct option therefore is (4). You can find all posts related to rotational motion on this site by clicking on the label ‘rotational motion’ below this post.